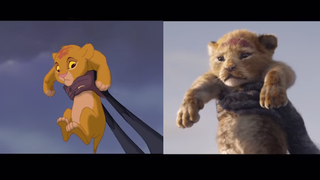 Case in point: This comparison video put together by YouTube’s Sowick1329, which places the footage from Jon Favreau’s just-released trailer for The Lion King in comparison with the 1994 original, and, if we’re being necessarily harsh here, finds it wanting. Favreau and the film’s marketing team have been very careful to recreate iconic shots from the animated version for their teaser, but in their effort to make everything “realistic”—or at least as realistic as “Hamlet but with big cats” can get—they’ve drained the Pride Lands of all the bold colors that made them such a lush visual spectacle for the original audience. To pick on one image in particular: Look at the closing shot of an adult Simba roaring at the rain-soaked sky. What’s more distinctive: The “real” lion on the right of the video, or the red-maned beast with the expressive cartoon face on the left?